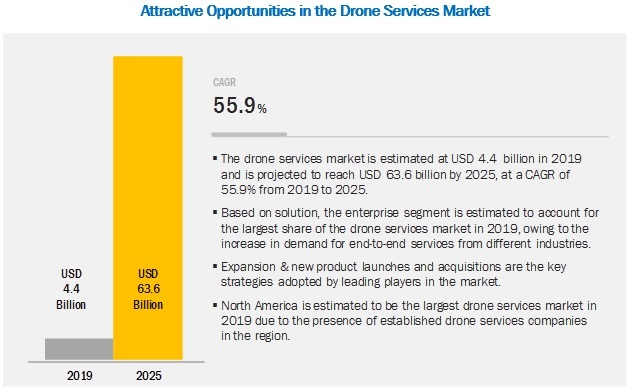 [174 Pages Report] The drone services market is estimated at USD 4.4 billion in 2019 and is projected to reach USD 63.6 billion by 2025, at a CAGR of 55.9% from 2019 to 2025. The factors expected to fuel the growth of the drone services market include the increasing use of drone services for industry-specific solutions, improvised regulatory framework, and increased requirement for qualitative datain various industries. By solution, the enterprise segment is expected to grow at the highest CAGR during the forecast period. Based on solution, the enterprise segment of the drone services market is expected to grow at the highest CAGR during the forecast period. Enterprise solutions provides end-to-end services to all industries. Increasing demand for analytical services and software solutions in the drone services market is driving the enterprise solution segment. Aerial photography and remote sensing segment expected to grow at the highest CAGR in the drone services market during the forecast period. Based on application, the drone services market has been segmented into aerial photography and remote sensing, data acquisition and analytics, mapping & surveying, 3D modeling and others. The aerial photography and remote sensing application segment is expected to grow at the highest CAGR during the forecast period. There has been an increase in the demand for aerial photography from the infrastructure, architecture, civil engineering, and oil & gas industries around the world. The Asia Pacific region is expected to lead the drone services market from 2019 to 2025. The Asia Pacific drone services market is projected to grow at the highest CAGR during the forecast period. This growth can be attributed to the increasing number of drone services being used by prominent industries such as agriculture, mining, and oil & gas in the region. Major players in the drone services market include Aerobo (US), Airware (US), Cyberhawk (UK), Deveron UAS (Canada), DroneDeploy (US), Identified Technologies (US), Measure (US), Phoenix Drone Services (US), Prioria Robotics (US), SenseFly (Switzerland), Sharper Shape (US), Sky-Futures (UK), Terra Drone (Japan), The Sky Guys (Canada), and Unmanned Experts (US), among others. in January 2019, Terra Drone Corporation entered into a joint venture with Plimsoll UAV Brazil, with the aim of expanding its oil & gas industry customer base in Brazil. This joint venture increased the global footprint of the company. in May 2018, Sky-Futures Ltd. partnered with NATS, UK to provide commercial drone pilot training. In January 2018, the company signed a partnership with Bureau Veritas to provide industrial inspection services through drones in Europe. In February 2018, Identified Technologies added new features in its drone mapping service software such as haul road analysis and slope maps to enhance the drone services provided to industries such as mining and infrastructure. What are your views on the growth perspective of the drone services market? What are the key dynamics and trends that govern the market, such as drivers and opportunities? What are the key sustainability strategies adopted by leading players operating in the drone services market? What are the new emerging technologies and use cases disrupting the drone services industry? Which are the key applications where drone services play a significant role? What are the key trends and opportunities in the drone services market across different regions and respective countries? The study involved four major activities to estimate the current market size for drone services. Exhaustive secondary research was undertaken to collect information on the market, the peer markets, and the parent market. The next step was to validate these findings, assumptions, and sizing with industry experts across the value chain through primary research. Both, top-down and bottom-up approaches were employed to estimate the complete market size. Thereafter, market breakdown and data triangulation procedures were used to estimate the market size of segments and subsegments. In the secondary research process, various secondary sources, such as D&B Hoovers, Bloomberg, BusinessWeek, and different magazines were referred to identify and collect information for this study. Secondary sources also included annual reports, press releases & investor presentations of companies, certified publications, articles by recognized authors, and drone services databases. After arriving at the overall market size—using the market size estimation processes as explained above—the market was split into several segments and subsegments. To complete the overall market engineering process and arrive at the exact statistics of each market segment and subsegment, data triangulation and market breakdown procedures were employed, wherever applicable. The data was triangulated by studying various factors and trends from both, the demand and supply sides of the drone services industry. This research report categorizes the drone services market based on industry, solution, application, type, and region.